dPS Mid Year Sale: Buy One eBook Get One FREE! Summer holidays are upon many of us, and it's time to select some reading. 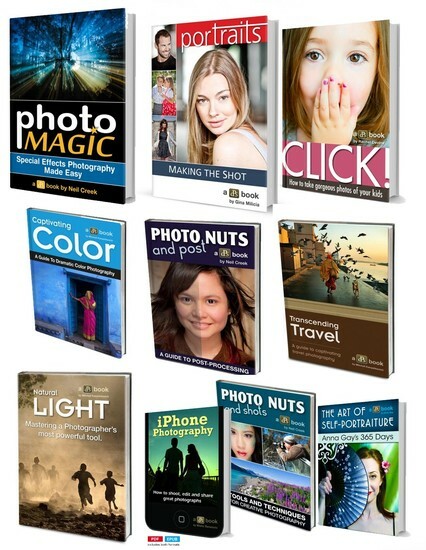 DPS offers you a selection of their best photography eBooks with a bargain: buy one, take two. But hurry, it's for one week only! Even if you're not enjoying Summer, it is always a good idea to have some eBooks you can take anywhere, in your smartphone or tablet, to read when and as you please. I know I do: I've eBooks in my Windows Phone 8 so I can always use time in an intelligent way. With conventional books you would not be able to carry a few books with you, but these days, with digital editions, you take a whole library with you, anywhere you go. So, if you are looking for some eBooks to read, this may be the right time to pick some, from the collection of popular photography training eBooks from Digital Photography School. For the next week - and only during the next week, believe me - you can pick up to two dPS eBooks for the price of one. That's right - if you pick up one of dPS eBooks this week you can select any other eBook from their range that is either equal to or less than the value. What this means is that you can effectively bundle any two of dPS' eBooks and save up to 50%! it is probably the right time to buy some eBooks you've wanted to have but have not yet bought. there are multiple combinations you can make. For example, if you want to improve your portraiture you might pick up a copy of Kids Photography eBook and then choose Portraits: Making the Shot eBook to get for free, saving yourself $20. But the options are almost endless. Another example: if you're wanting to get to know what your camera is capable of you might choose to bundle up Photo Nuts and Bolts with Photo Nuts and Shots (the perfect combination for getting creative control of your camera), saving yourself $30. If you're going to be travelling pick up our Travel Photography eBook and bundle it with our Natural Light eBook (so you don't need to pack a flash). So now you know...there are so many combinations! And the price is so tempting. But remember, this is a special dPS Mid Year Sale: Buy one eBook get one FREE! And the deal ends in just one week.